To this day “ Star Trek II: The Wrath of Khan” is widely revered for many good reasons — among them Ricardo Montalban’s memorable performance as well as a certain plot twist at the end — but in this post I’ll focus on the genius of the film’s second sequence and what screenwriters can learn from the well-executed screenplay by Jack B. Sowards. What makes a sequence filled with exposition set primarily in a confined space so dramatic and compelling? First, what is the goal of the sequence? To meet the antagonist, Khan, and, as with all sequences, to propel the story forward. But what of the challenge of revealing key information in a lengthy scene that plays out in a confined space? Chekov is on a mission to discover a lifeless planet to test Project Genesis. Kirk is “trapped” in a desk job of sorts and is in denial about it. Aging — or, at the least, carpe diem — is among the story’s themes. Plot, character, theme are introduced. And while we have not yet met Khan, aging is thematically introduced first through Kirk, then later reinforced by Khan, and again later by David and Carol Marcus. Theme is seamlessly woven throughout the cast. The second sequence also provides backstory essential to the audience’s perspective — especially for those who may not have seen the television episode that first introduced Khan. Why should we care about Khan? How dangerous is he? Why is he to be feared — what makes him a superior foe? What is Khan’s motivation for the actions he’ll take? A well-motivated superior antagonist is at the heart of the best stories. Chekhov, are you sure these are the correct coordinates? Captain, this is the garden spot of Ceti Alpha Six. Chekov and Terrell discover the cargo holds… and enter. Chekov realizes the obviously inhabited cargo holds belong to the Botany Bay — dreadfully significant to him but Terrell at this point doesn’t understand. Chekov and Terrell quickly exit, but are captured by the mysterious cloaked people. Moments later, back in the cargo holds, Khan removes his cloak and mask — Chekov immediately recognizes him. Khan and Chekov exchange greetings — but Terrell is still in the dark. Khan and Chekov reveal the key backstory elements the audience needs to know. Khan realizes Chekov and Terrell thought they beamed down to another planet. Khan wants to know why they beamed down — but they won’t talk. 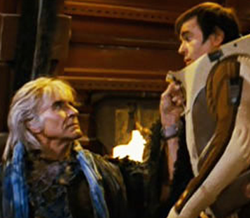 Khan introduces Chekov and Terrell to Ceti Alpha Five’s “only remaining indigenous life form” — adding some additional backstory in the process. 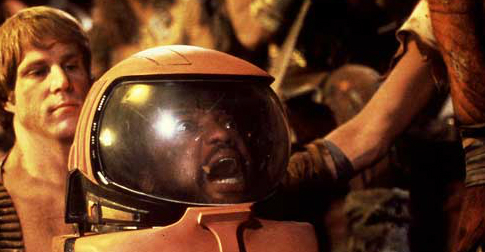 Chekov and Terrell scream as the tiny creatures slither into their ears. So the 10-page sequence — set in a confined space — dramatically introduces the bad guy, reveals key backstory, jeopardizes the safety of the top-secret Genesis project, and introduces the Khan-Kirk conflict in a way that suggests Kirk will face a tough challenge when he and Khan next meet. Chekov, who is this man? You are in a position to demand nothing, sir. I, on the other hand, am in a position to grant nothing. What you see is all that remains of the ship’s company and crew of the Botany Bay, marooned here fifteen years ago by Captain James T. Kirk. Of particular interest is the subtle action Montalban injects into the scene amidst his chunks of dialogue — a reminder to trust what experienced actors can bring to the table. He never told you how Admiral Kirk sent seventy of us into exile on this barren sand heap with only the contents of these cargo bays to sustain us? THIS is Ceti Alpha Five. Ceti Alpha Six exploded six months after we were left here. The shock shifted the orbit of this planet and everything was laid waste. Admiral Kirk never bothered to check on our progress. It was only the fact of my genetically engineered intellect that enabled us to survive! On earth, two hundred years ago, I was a prince, with power over millions! Captain Kirk was your host! You repaid his hospitality by trying to steal his ship and murder him. You didn’t expect to find me. You thought this was Ceti Alpha Six. Why are you here? Note the absence of parentheticals and other attempts to “direct” the characters’ emotions. If you’ve successfully placed your contrasting characters in a dramatic situation, the scene’s inherent emotion will surface. Of course, such lengthy dialogue should be avoided, but Khan’s exposition here is nonetheless instructional because you can feel the emotional shifts in the beats of his dialogue — each phrase is revealing, emphatic, rhythmically delivered with conviction, melodically escalating the tension. As the scene unfolds it is increasingly obvious not only that Chekov and Terrell have no escape, but also that Khan is not exactly Mister Nice Guy. Allow me to introduce you to Ceti Alpha Five’s only remaining indigenous life form; what do you think? They’ve killed twenty of my people, including my beloved wife. Oh, not all at once, and not instantly, to be sure. You see, their young enter through the ears and wrap themselves around the cerebral cortex. this has the effect of rendering the victim extremely susceptible to suggestion. Later, as they grow, follows madness… and death. Note that lengthy block of dialogue in this case doesn’t include Khan’s actions, such as when he jabs at the creature on the “including my beloved wife” comment. If your bad guy speech is lengthy, consider injecting some relevant, specific action that could break up the text without derailing the scene’s momentum. At a sign, the helmets are slammed down. As the muffled shrieks are heard from within, the eels crawl across the faces of Chekov and Terrell; with unerring instincts they head for the ears of the two hapless men. There is some atrocious pain as they enter — then dazed calm. That’s better! Now: tell me why you are here — and tell me where I may find James Kirk. A SPACE SHUTTLE moving toward us. Enterprise to Admiral Kirk’s shuttle. Prepare for docking. Approach port side, torpedo bay. A new composite. Bones, Sulu, Uhura, and Kirk – who sits, reading…. The sequence ends with a great cliffhanger that seamlessly flows into the following sequence, starting with Kirk aboard a shuttle to inspect the Enterprise — happily oblivious to Khan’s wrath yet to follow. I’ve found Linda Seger’s Making a Good Script Great to be a particularly useful reference regarding scene structure and subplot integration and a must-read if you are new to screenwriting. Previous Previous post: Spoiler alert: Oscar winners! Next Next post: What do you want to know about script coverage?